Trump is working with Apple to give students more technical skills. Ivanka Trump traveled to Wilder, Idaho, Tuesday to meet with Apple CEO Tim Cook and learn more about a technical skills training initiative that Apple has implemented in the rural community. Trump sat in as elementary school students worked with their mentors to work on interpersonal skills, which Trump said are the building blocks to the future of the American workforce. Students in the elementary school are learning coding skills and have access to a wide range of technology, thanks to the partnership with Apple. Trump told ABC News' Deborah Roberts on Tuesday that the access to technology "opens up a universe" to the students, and that watching the students respond to the new opportunities was "deeply inspiring." "This is the future American workforce," Trump said. "And so we have to start now, thinking about how we can put them all on pathways to succeed, wherever their passion takes them, wherever their lives take them." 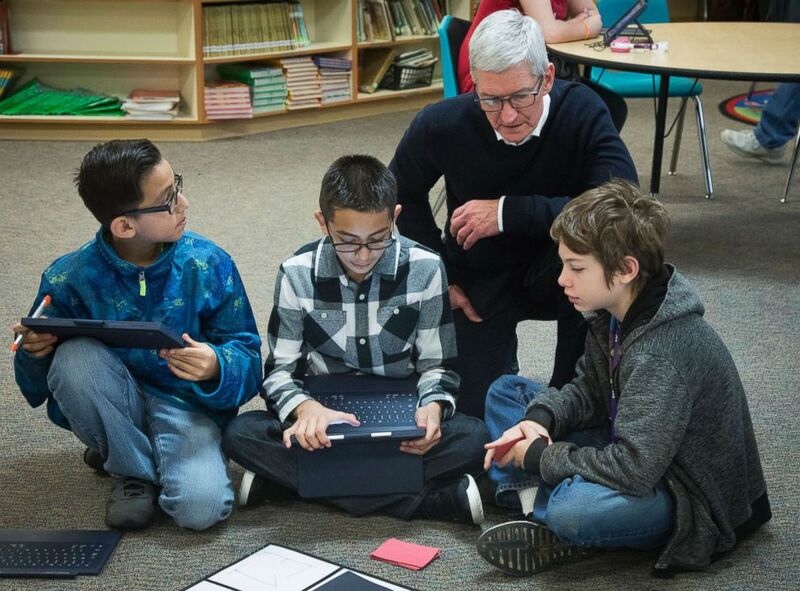 (Katherine Jones/Idaho Statesman via AP) Apple CEO Tim Cook talks with Marco Aranjo, left, Fernny Flores, and Hunter Lansdell, about the coding they've done as they play a self-programmed game of Battleship at Wilder Elementary School, Nov. 27, 2018, in Boise, Idaho. The students Trump observed are some of the youngest partaking in an initiative she is leading to expand access to technical training nationwide. Other nationwide programs focus on training at the high school and college levels, as well as helping adults learn new skills to keep them professionally competitive. "I view education as this tremendous equalizer, but I think for too long, we've thought about education as really stopping once one leaves high school, and that maybe some people go on to post-secondary education or college" Trump said. "But to think about it holistically and ensure every American in this unbelievable economy has the skills they need to secure a job and be able to take care of their families is so so important." This is the latest in a series of trips Trump is taking to 20 states in order to learn more about how to better train American workers for science and math careers. Earlier this year, Trump traveled to Iowa on Cook's recommendation, where she visited a learning center that focuses on attracting high school students to STEM programs and preparing them for collegiate math and science tracks. Tuesday's visit also came at the recommendation of Cook, who Trump said has become a "very good friend" since Trump began focusing on job training as part of the National Council for the American Worker. Cook said he was thrilled that the program was helping students develop both technical skills and other soft skills to make them employable and was happy to see students working together on projects. "The most -- the largest thing that either prevents or makes people successful is the ability to collaborate," Cook said. As Cook toured the school with students he joked with them, asking if they were "ready to go work for Apple." Cook told students he was impressed by the skills they were gaining at the school and said he wished more schools had programs like the one he and Trump saw Tuesday. (Katherine Jones/Idaho Statesman via AP) Apple CEO Tim Cook, right, and Ivanka Trump, left, daughter and adviser to President Donald Trump, watch as first-grader Salvador Esparza shows them work he's doing on a video during a visit to Wilder Elementary School, Nov. 27, 2018, in Boise, Idaho. "The more skills you gain the more you're able to do, and I think you guys have a school that is doing so well," Cook said to the students. "I want everybody to see it." Trump said in the interview with ABC News on Tuesday that Cook has "been a great partner in helping us think about how we innovate as we think about job training, as we think about workforce development, and as we think about ensuring that this country's greatest asset, the American worker, is being invested in." The National Council for the American Worker was created by President Trump in July to address skills gaps in the U.S. workforce. Ivanka Trump serves on the council alongside several of the president's cabinet members. One of the council's initiatives aims to create partnerships with U.S. companies to expand career training opportunities. Apple is one of over 100 companies that are participating in the council's goals to expand science and math training opportunities nationwide. On it's own, Apple has promised to create 10,000 new training opportunities for workers as part of the initiative. 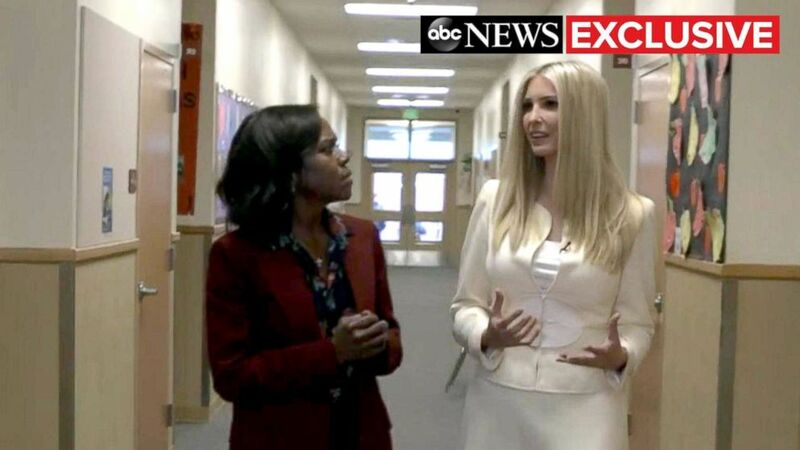 (ABC News) Ivanka Trump sits down with ABC News' Deborah Roberts for an exclusive interview, Nov. 27, 2018. Many of the communities that are being focused on have higher rates of poverty, where access to technology is limited. "I've seen the diversity of opportunity. I've seen the diversity of poverty that exists in this country," Trump said. "So you need to look at the localized action and look at the localized solutions." Trump said she's found the individual stories of people she's met on her trips to be the most inspiring part of the initiative.